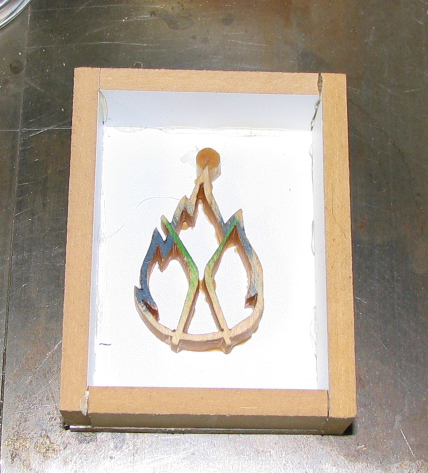 My idea was to produce a mold, then pour in casting resin or some such, to produce a part with open spaces. Once these parts are trimmed and sanded flat I could pour different colored stuff into the voids, producing a "solid" medallion. Maybe I can figure out how to stick an LED in there somewhere, too. Whaddya think? Saturday, May 5: Struggling up the learning curve... In my first attempt I wasted a lot of time doing a pile of carving with teeny weeny tools. After many hours of this I finally figured out that sculpture ain't my bag. After ruminating on my crummy results for a few weeks I switched horses and got out my jigsaw. Results were much improved. Next thing was to figure out how to make the wooden pattern goo-proof so that, after I'd poured and cured an RTV mold around it, I could get the pattern back out intact. I'd hate to trash it in the process! I'm thinking of dipping it in wax or maybe blopping on car wax, then ever so gently wiping off the excess. 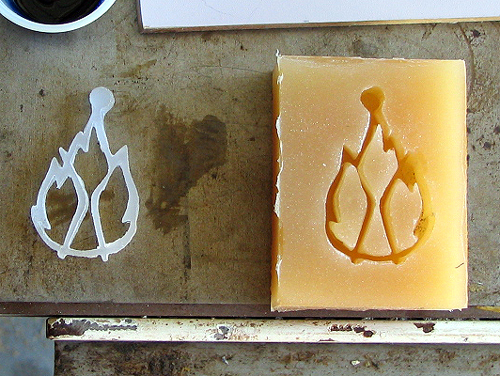 Photo #1: Early stages on left, final product on right. Before it got to this point I printed the image (a .gif file from our logo on tribe.net) on transfer paper. I ironed the printed image onto a block of wood, then soaked it in warm water to removes the paper, leaving a "decal" made from printer ink and a thin plastic film. 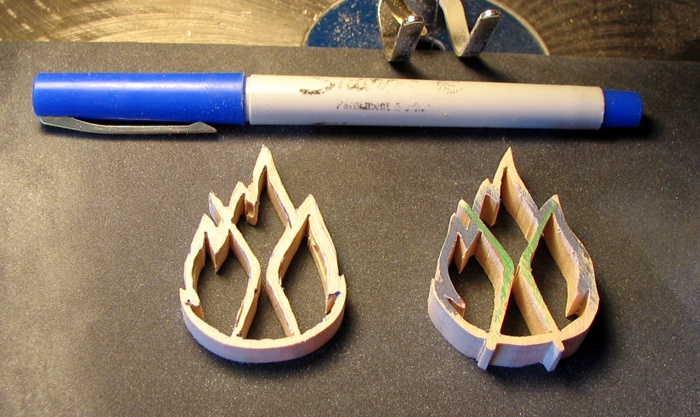 After that all I had to do was drill some 1/8" holes to get a jigsaw blade into each area and start sawing away. Magnifying glasses were a big help. 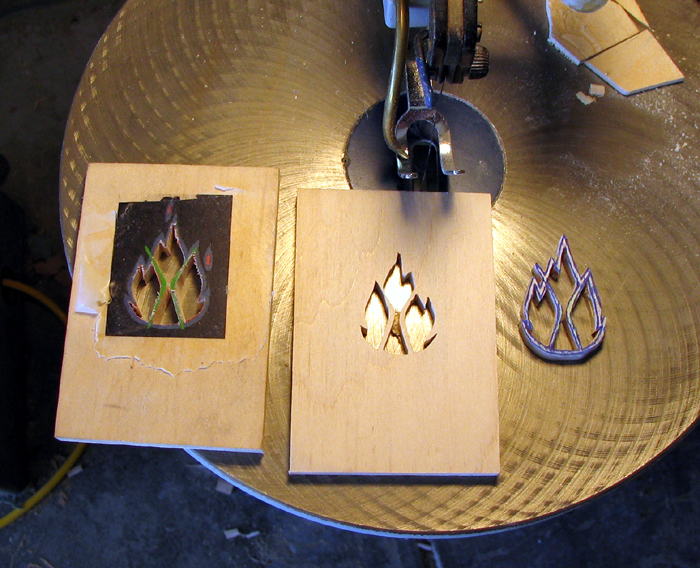 Photo #2: Not half bad, considering... First attempt on the left, second on the right. Aesthetics are slightly better on second one. I practiced detail carving on the first one and promptly split it in one spot. Don't think I'll try that again on the good one. Not sure if I should dress it up with a sanding stick or just go with it as is. 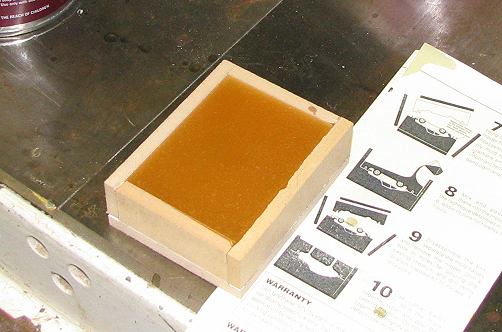 Photo #3, Sunday, May 7: After dipping part in hot wax two times, to smooth out marks made by jigsawing to shape. Mold box is made out of a spare hunk of coated 1/4" material I found in the shed. Note addition of round section to top of pattern. 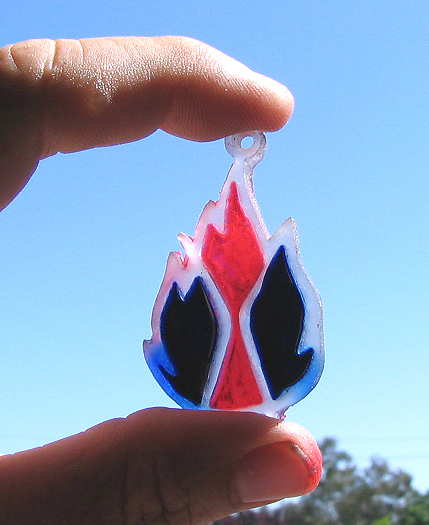 Once cast it can be drilled out for a necklace string. Photo #4: Goop poured into mold. I shimmed one side with bits of paper, as my shop's floor isn't quite level. Once this was done I stuck it all under a lamp with a 60 watt bulb for the remainder of the day and overnight. By morning it was ...well, mostly cured. Photo #5, Monday May 8: Mold out of mold box; looks pretty good but there was some bleed thru and I had to sand this surface to fully reveal the pattern's edges. 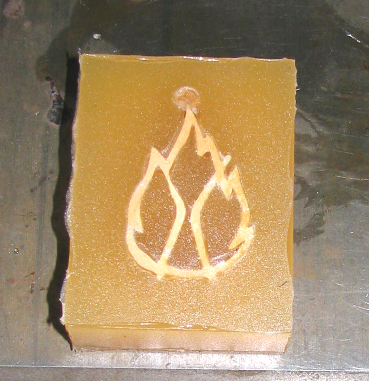 Photo #6: After a lot of struggle I managed to prize the pattern out of the mold. I found that the perfect tool for extricating it was a paint can opener. 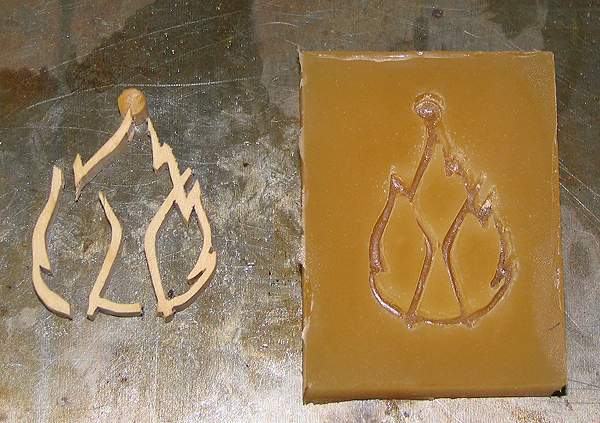 Lessons learned: paraffin is the wrong stuff to use to smooth a pattern: it melted in the hot mold curing process. It makes a lousy mold release too... Still and all the mold came out looking pretty good. 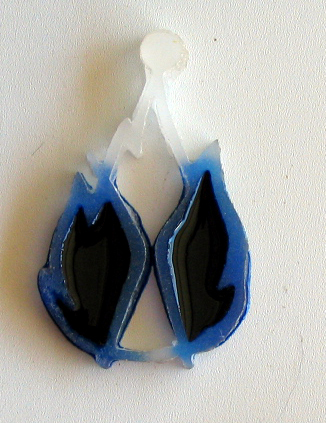 Oh, and the depth I poured to encapsulate the pattern was way too much, making it difficult to flex. Photo #7: First part cast and out of the mold. This time I used Pam as a mold release. The stuff is supposed to cure in "90 seconds" but it was a lot more like 90 minutes! I kept it under the 60-watt bulb to maintain all at the recommended cure temperature of 140 degrees. But the part was still flexible when I dug it out of the mold. After I got it out I stuck it under a hunk of steel to flatten it overnight. Photo #8, Tuesday, May 9: Here I've sanded the part top and bottom, to take off flashing and to thin it a bit. At this point I poured some more of the same goop, tinted blue, into two of the chambers. The remaining space will get red dye. Lesson learned: a little of the dye goes a loooong way; I used less than a drop this time; I'd use a lot less next time. Photo #9: First one done I guess. Definitely a long way from beautiful. Lessons learned this time: Pam makes a rotten mold release on Melamine; will try paste wax next time. The Alumilite goo cures as advertized without a lamp shining on it; if anything I'd say the lamp hinders cure time (keeping the mix soft due to low melting point of the resulting plastic?). I barely touched the mixing stick to the red dye and the mix came out much more translucent. Note eyelet has been drilled and chamfered; the stuff machines very easily. In the interest of saving time (I want to show off the thingy tonight) I left out the burning guy's brass "head".